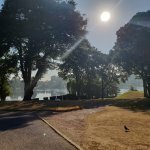 5th July saw absolutely glorious weather for our annual golf day at Mere Golf Resort. Huge thanks to all our clients who attended and helped make it a memorable day as always. 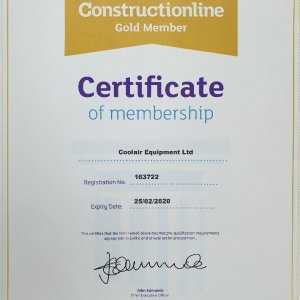 Coolair have recently passed the MCS (Micro-generation Certification Sheme) assessment and are delighted to be registered with the industries leading certification body. This enables us to offer existing and new customers an added service as the industry moves towards the use of more greener solutions particularly the use of renewable energy. For more information please contact your local Coolair Sales Office. As new data protection rules are set to come into force Coolair are awarded Cyber Essentials Plus Certification. Having this certification clearly demonstrates to our clients that we are extremely serious about safe guarding commercially sensitive data, and that we manage our business processes in a secure environment. 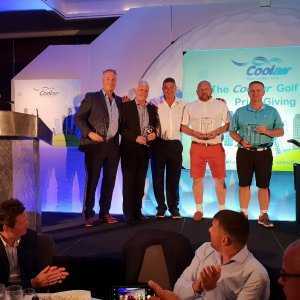 The award was presented by Tony Burrisson of ACR our long standing IT support partner to Helen Sharratt Coolair’s finance Director. 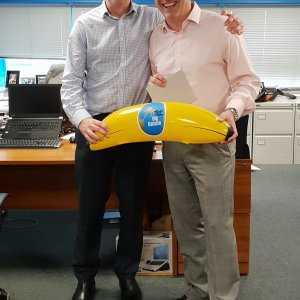 John Otterson Coolair’s MD presents Neil Gibbard (Right) with our Top Banana award for highest sales during 2017. Neil our Midlands Regional Director has now been presented with this award 4 times. Well done Neil and a big thank you to all our customers !